A busy Sunday at the Ciutat Esportiva with Ernesto Valverde’s first team squad receiving visits from Barça figures past and present. 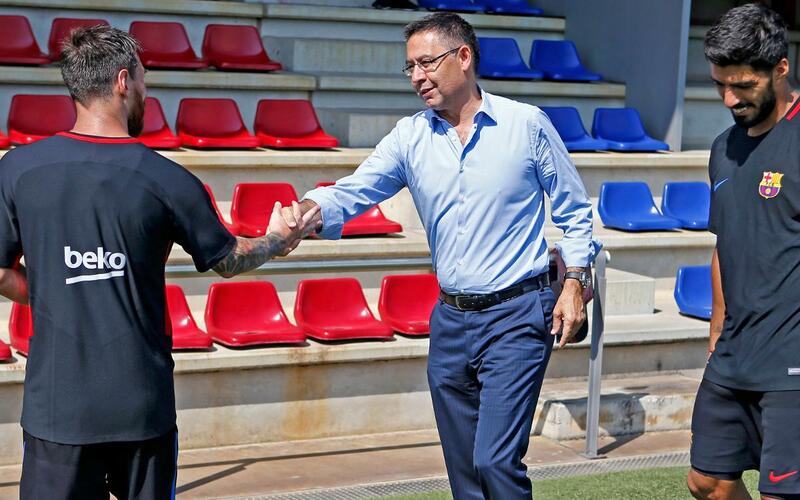 Club president Josep Maria Bartomeu called in on the new coach, his back room staff and the players at the end of the session to see how things were going at the end of the squad’s first week back at work. Manager of the Football Area Pep Segura and Barça B coach Gerard López also appeared at the end of the session to say hello to the squad with several B players working under Valverde’s instruction at the moment. Barça B return to training on Monday to begin their preseason and get ready for their return to the Second Division A after last season’s successful promotion campaign. A surprise visitor was former Barça defender Gabi Milito who played for the Club between 2007 and 2011, winning 10 trophies in that time. The Argentine was reunited with his former team mates Piqué, Sergio, Iniesta, Messi and Javier Mascherano as well as taking time to chat with new coach Ernesto Valverde.